Behold, the "Queen of Snapchat." NannLL, a 20-year-old from Norway, has dubbed herself the "Queen of Snapchat" for good reason. According to Bored Panda, her stunning self portraits on the social media site are some of the best and funniest out there (and believe me, she has stiff competition). The "Queen of Snapchat" (whose work you can also view on Instagram) takes on a variety of subjects in pop culture, from Fifty Shades of Grey to Wonder Woman and even Dr. Phil. 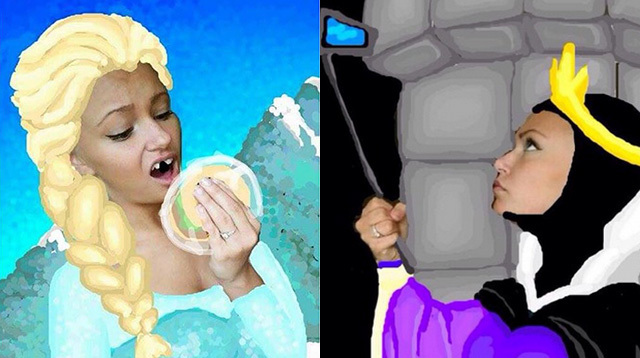 NannLL even has some fun with a few Disney princesses. This is impressive, considering every drawing I attempt on Snapchat comes out looking like something a cat barfed up.